Sometimes simple is best and with these sausage rolls that is certainly true, you could sprinkle the pastry with sesame or poppy seeds before placing in the oven for additional crunch. Roll out one sheet of puff pastry and cut in half. Take one cocktail sausage approximately 1cm from the edge of the pastry. Brush the pastry edges with some egg, fold over the pastry and seal. Repeat with the remaining pastry and sausages. Place the sausage rolls on a parchment lined tray. Brush the tops with the remaining egg and sprinkle with sesame seeds. 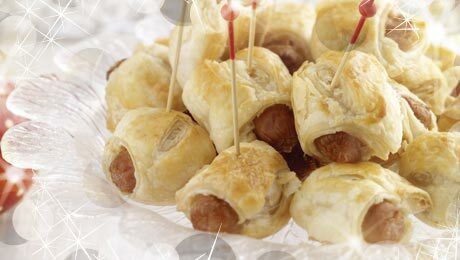 Place in a preheated oven and bake for 30-35 minutes until the pastry is golden and sausages are cooked. Combine ingredients in a heavy-bottomed pot on medium-high heat. Bring to the boil stirring frequently. Simmer until mango softens and the mixture begins to thicken and become syrupy. Pour into sterilized jars, cover, and refrigerate. To preserve, do not cool chutney. Spoon hot chutney into sterilized half-pint or smaller jars, wipe rims clean, and top with a new canning lid. Remove from water, check that each lid has sealed. Store on the shelf for up to one year. Store any jars that did not seal in the refrigerator and serve within a month.